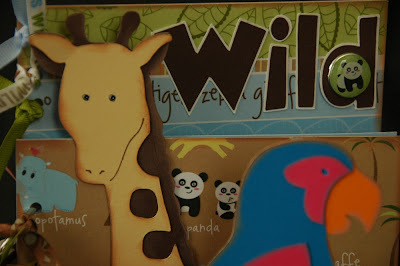 Wild About You! More Pics! 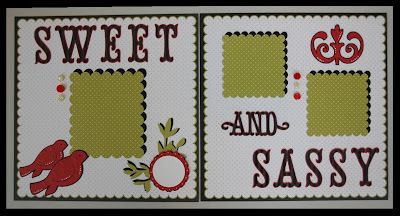 The Cricut Kit Sale is ON!!! Here it is!! A Child's Year - My First Project!! I don't just love you - I'm Wild About You!!! Here's my latest creation. 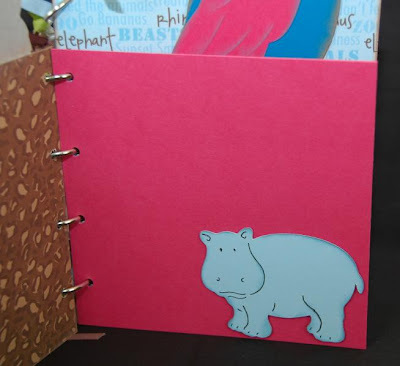 It's a 12x6 book, perfect for zoo pics or just your own "wild animals". I will be teaching this as a class here at my home in Rocklin on Wednesday, September 23rd at 6pm. Class fee is $25, which includes all materials. (Kits may also be available, as well as shipping at an additional cost.) 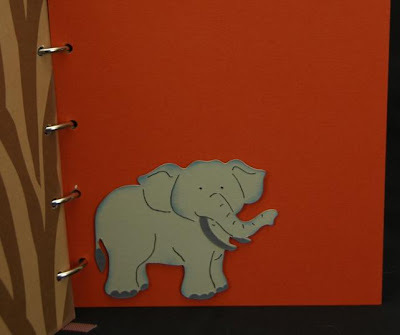 You'll just need your Cricut Expression and the Animal Kingdom cartridge. I also used the Mickey Font cartridge, but any font cart will do if you don't have that one. If you're interested in signing up for this class, you can leave a comment here with your email address or you can contact me at moniquegriffith@yahoo.com. There are additional pictures below this post - so a total of 10 pics. 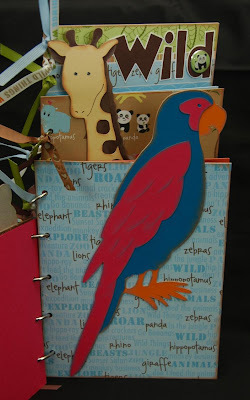 One of these days I'll finally learn how to put more than 5 pictures in a post, LOL! Thanks for stopping by! 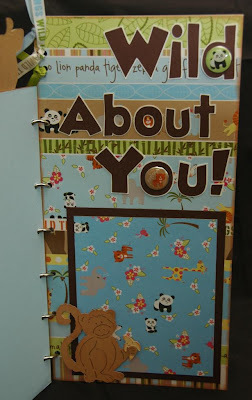 Here are additional images from the Wild About You book, including the inside back cover. When it's finally opened up all the way, you can see the whole title. Ah-ha! 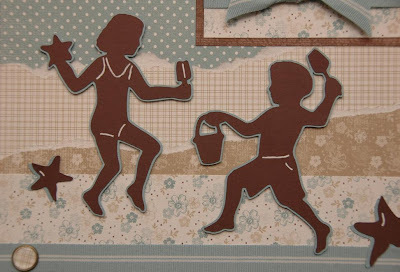 Here are the 7 Cricut kits that are now on sale for 20-50% off. Be sure to see the post below this one to view additional pictures of available kits. 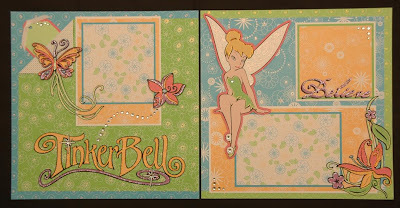 All kits include: All of the necessary patterned papers, cardstock, ribbon, brads, etc. that are used in the project. 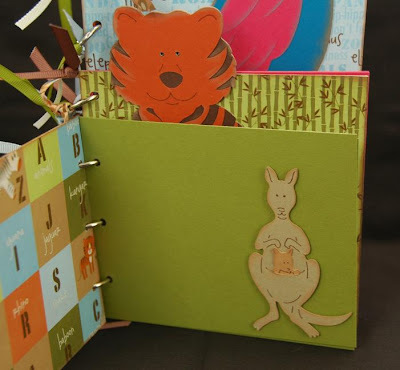 In most cases, things such as photo mats and border strips are pre-cut for you. 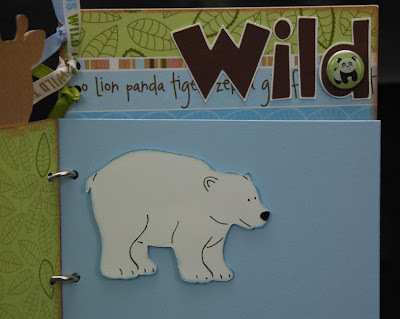 I also include very easy to follow, step by step directions with a Cricut Cut Chart. The chart shows you line by line exactly what you need to cut on your bug, what color, size, feature buttons, blade, pressure, page in booklet, etc. And all cuts are grouped by color to make your life easier. 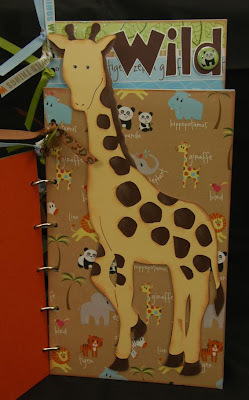 And when there's a different technique, such as cutting chipboard or using Cricut markers, that is explained in your directions as well. 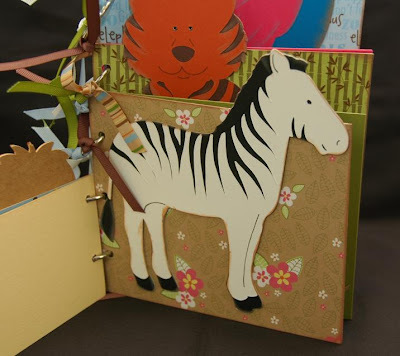 The directions include at least one full color photograph for layouts, but other projects such as the Dream Book and Indie Art Explosion Box include several pages of full color photographs so you can see exactly how to assemble the project. Shipping is available, and is $5 for the first kit and $3 for each additional kit. I'll ship within 1-2 business days. PayPal preferred. Prices good through 7/31/09, and only while supplies last. 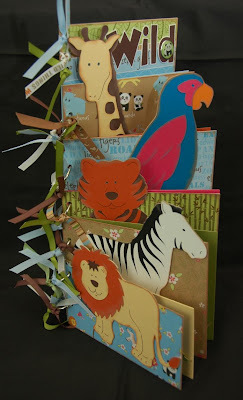 All designs are copyrighted, and are for personal use only, and not to be entered for publications or contests. You can contact me at: moniquegriffith@yahoo.com if you have questions or would like to place your order. Or leave a comment here with your email address, and I'll get back to you. 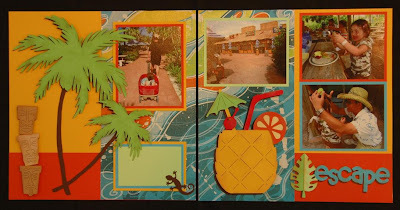 Tropical Escape layout - NEW KIT! 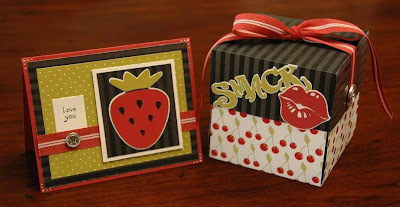 Just a heads-up to be on the lookout for my Cricut Kit Sale starting this Friday, July 17th. 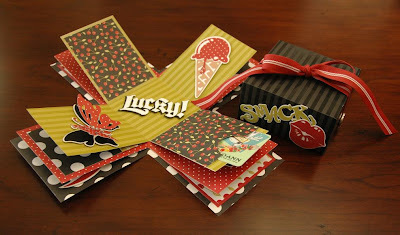 I will be offering several different layout and project kits (many of which have been featured on this blog) at 20-50% off. More details to come! Sugar and Spice and everything nice. That's what little girls are made of. And that's what the new cartridge "A Child's Year" is made of too. 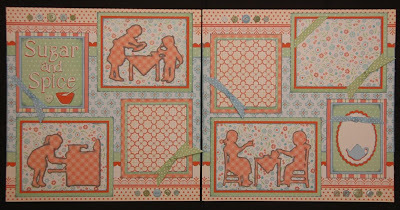 This cartridge is delicious, and I couldn't resist making an old fashioned kitchen layout with the adorable cuts it has to offer. 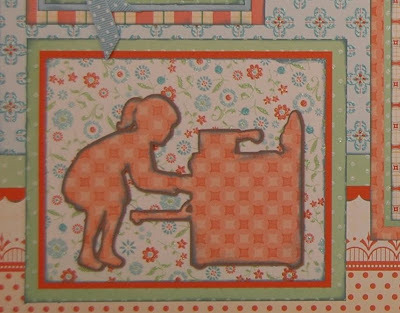 The child silhouettes were cut at 3 1/2" and 3 1/4". 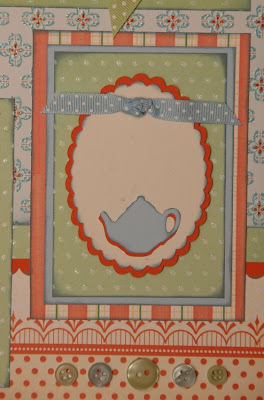 The beautiful scalloped oval that I used for a journal tag was also cut at those same sizes. The adorable tea pot is just 1". And how cute is that little mixing bowl and spoon? I feel like I should go make some cookies! 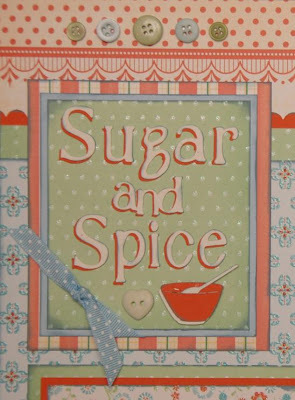 The title "Sugar and Spice" was cut at 1 1/4" and 1". There is no shadow feature for this font, but you can just as easily re-cut the same letters in a different color, and off-set them for a similar shadow effect like I did here. 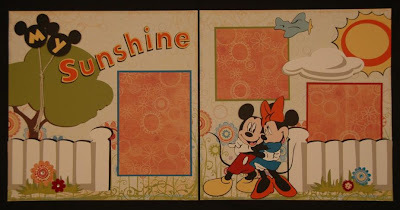 Have a sweet and heart-warming day!! 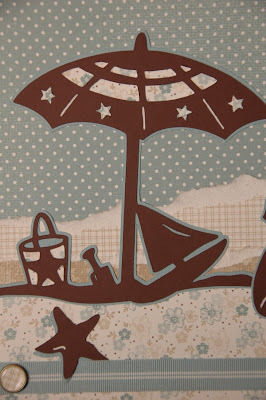 I've gone a little beach crazy recently, so when I saw the adorable beach cuts on my new favorite cartridge (A Child's Year, which was given to me by Provo Craft - thank you!! 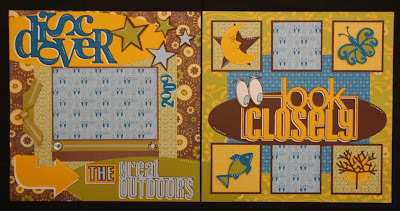 ), I just knew that I had to do this layout - and use my very favorite Stampin' Up! papers to go along with it. I plan to add some pics to the mats soon. The family pics we took in Florida on the beach should work perfectly. But really, I cannot say enough great things about this cartridge. It's beautiful, and I'm seriously tempted to make an entire album from just this cartridge - how fun would that be?!?!? 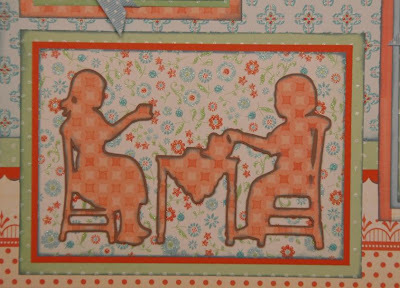 By the way, most of the silhouette kids in this layout were cut at 4 1/2", but the sitting child was 3 1/2 to keep her proportionate to the others. The umbrella was cut at 5 1/2", and the starfish are 1" and 1 1/2". I jumped around a bit with the font size, but the letters range from 1 1/4" to 2". And when you get your hands on this cartridge, here's a little tip for you. 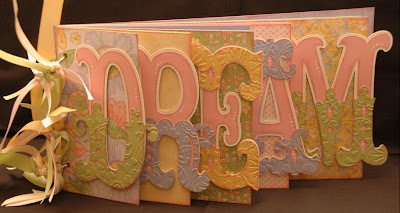 In the booklet, the letters of the font are not arranged in alphabetical order, so that can be a bit confusing at first. But if you flip toward the back of the booklet to where it shows what the entire keypad looks like with the Font feature on, you'll notice that the letters are actually placed in a Qwerty keyboard arrangement. So it's best to refer to that picture when you're trying to type out a word. 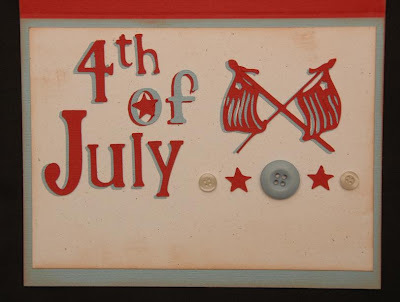 Have a wonderful weekend, and a Happy 4th of July!! If you don't yet know, I have had the incredible honor of being asked by Provo Craft to preview their soon to be released cartridge, "A Child's Year". 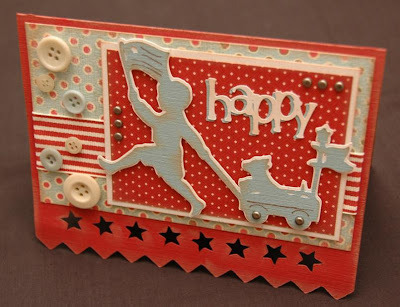 I received the cartridge this morning, and have just finished my first project - a card - just in time for tomorrow's holiday! This cartridge is amazing, and a definite Must Have!!! 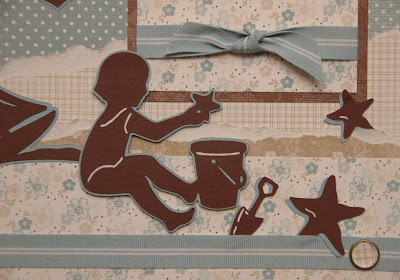 It even has a card feature button, which is how I cut out this card with the adorable stars in the border. There's also a versatile font, which I used on the inside. Wonderful, wonderful cart that I'm going to have trouble sharing for a little while - so go get your own, LOL!! !